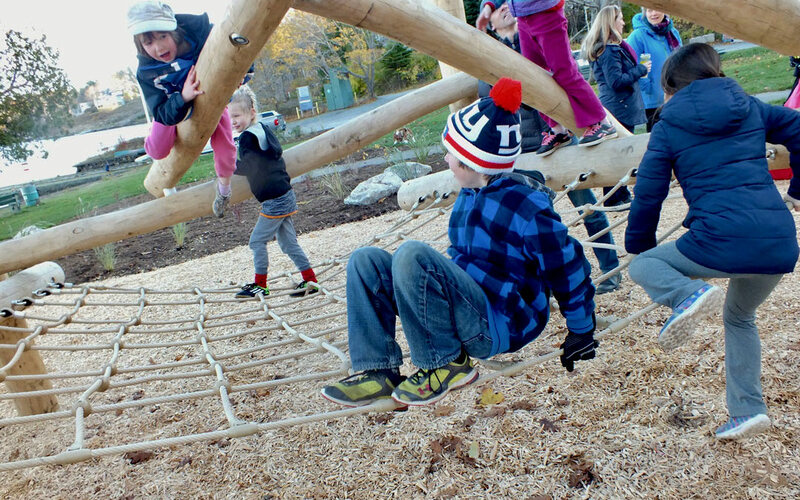 Drawing inspiration from the rich history of the surrounding landscape, Earthscape has crafted a space that that combines the unique cultural heritage of the site with exciting play environments that provide challenge, graduated risk, and opportunities for both social and sensory play. 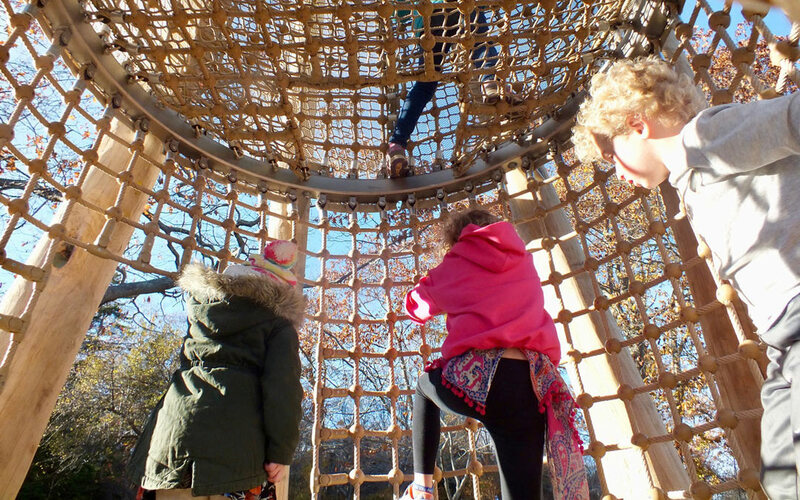 Three main access points beckon visitors deeper into the park and the closer to the play structures glimpsed from a distance. All paths lead to the main cluster of play spaces, while one path leads from these spaces to the beach area. Along the path to the beach, visitors encounter the Sand and Water Play area. Bordered by a concrete runnel on one side and natural log edging on the other, this area provides a multitude of play possibilities for all ages. A small natural log climber sits in the middle of the space providing opportunities for clambering and scampering. 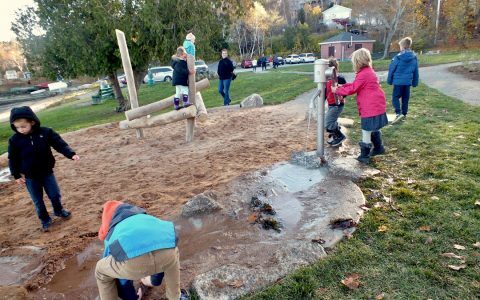 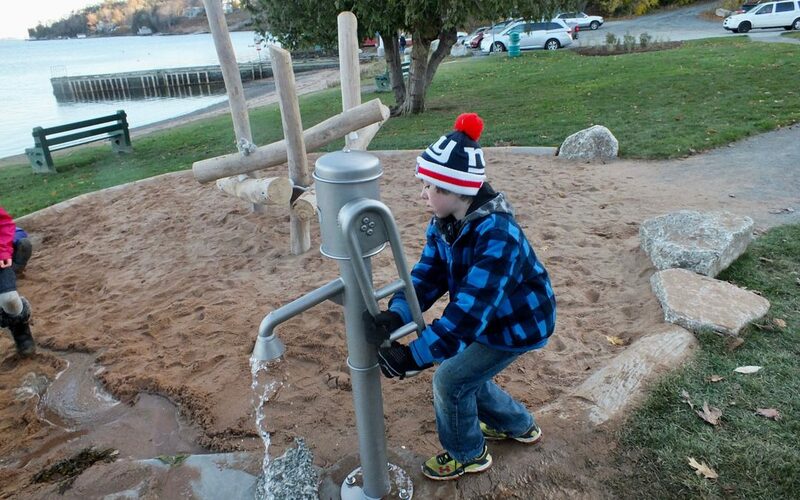 The functional water pump at the North end sends water down the concrete runnel where kids and can use the adjacent sand to construct dams and learn from the primal dynamics of flow and resistance, solids versus liquids, Sand versus Water. 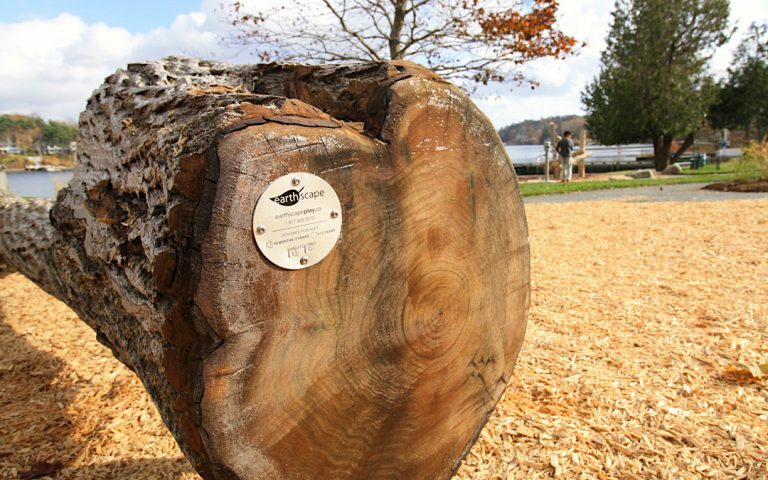 Entering the park from the southern parking lot, visitors proceed through welcoming entry plantings that delineate the park from the surrounding area. Proceeding North along the main path one encounters the senior play area. 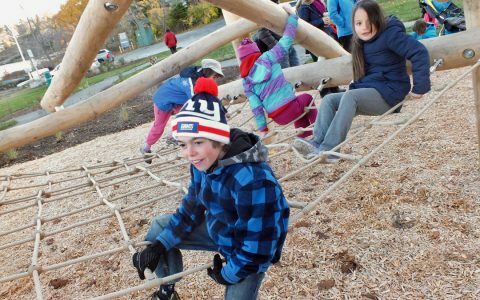 Bordered by the curbing sweep of a long, lush planting bed and dotted with boulder seating, this area boasts a custom robinia log jam designed to challenge young visitors with graduated risk and reward in a safe play space defined by the engineered wood fiber surfacing. To the West of the log jam, an epic log tower of wood and mesh echoes Dingle Tower and allows youngsters to climb up high for a birds eye view of the park and slide back down again along a long, curving slide. 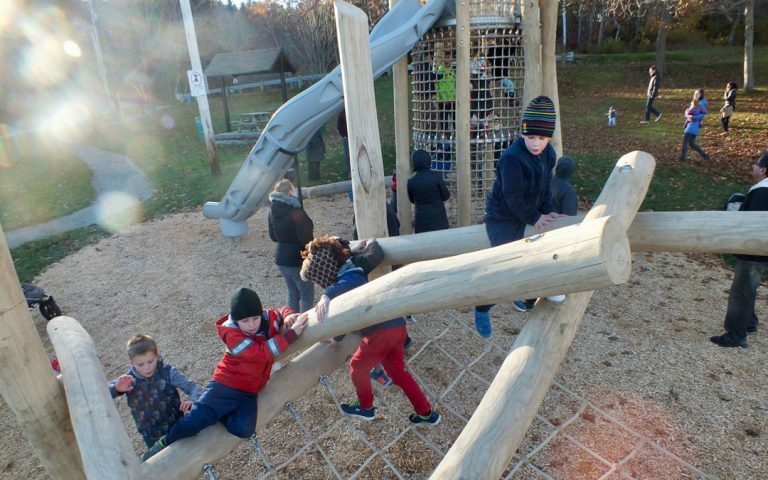 Further North along the path sits the junior play area. This area presents challenges and opportunities tailored for little ones aged 2-5. 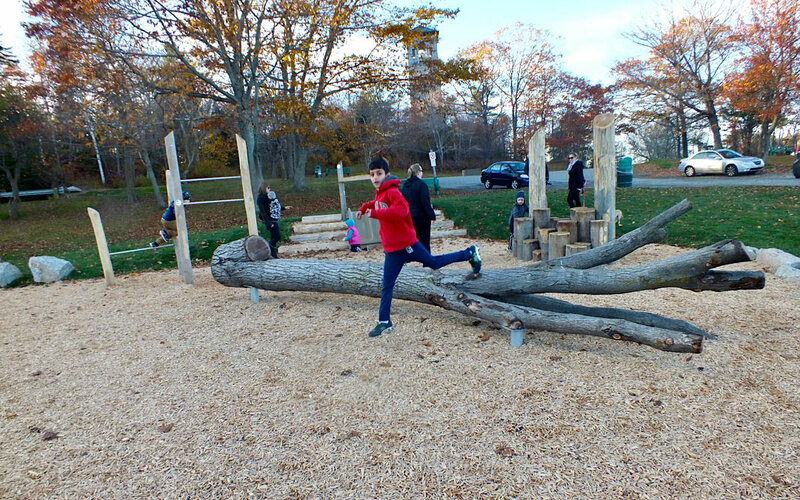 A fallen log climber and adjacent log steppers promote motor skill development at an appropriate scale for the age group. The West end of the area is defined by a wide hillslide nestled in a grassy knoll. 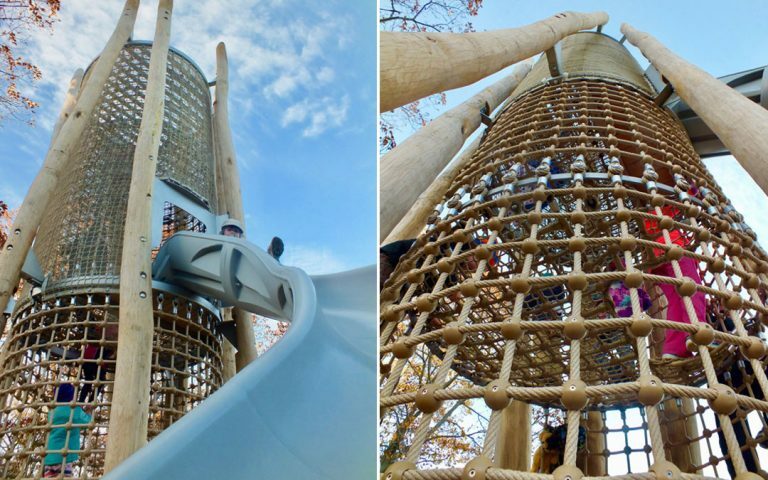 The slide itself if bordered by vertical log steppers on one side and log terraces on the other, both providing fun and challenging ways to clamber to the top. 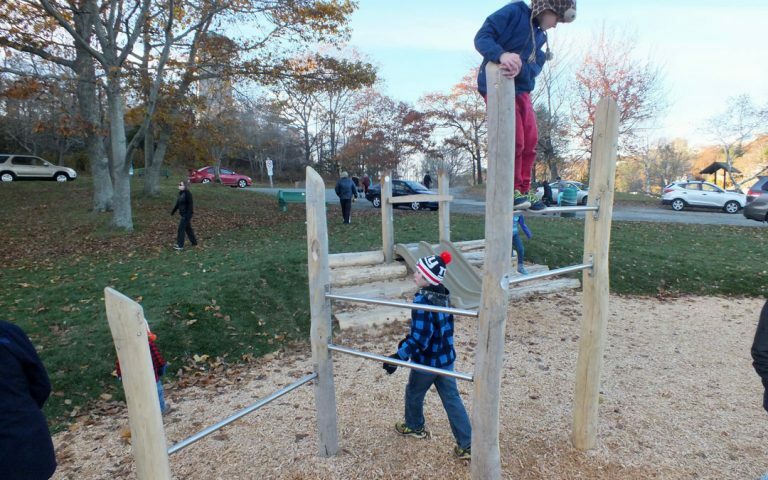 Finally, traditional climbing bars integrate more senior challenges for any older friends or parents sharing the space in with the little ones. Moving North again towards the other parking lot, visitors encounter the Musical Play Area. 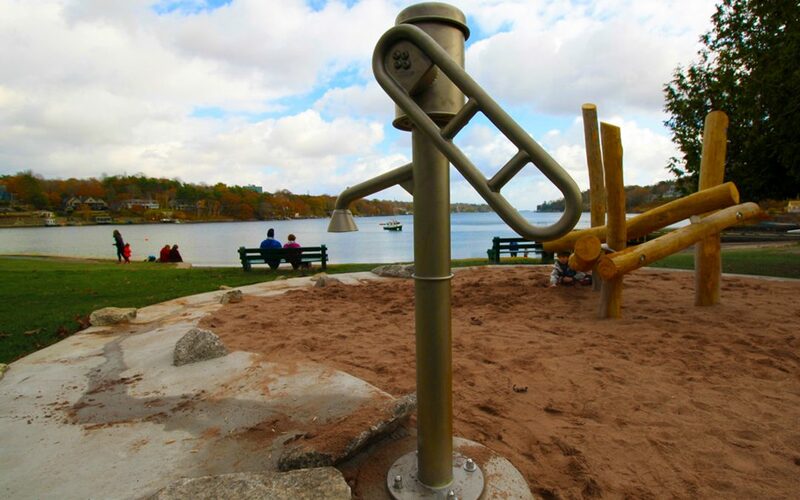 Nestled in between two masses of tall grasses, 3 specially designed outdoor musical instruments stand clustered and ready for use. The instruments are all specially tuned so there are no wrong notes, and any combined cacophony from any or all of the instruments is sure to be in harmony.